Cell phone forensic software is freeware utility that easily extracts your entire mobile and sim related data including IMEI number, sim IMSI number, phonebook entries with name and number, text message of all Symbian OS based Nokia mobile phones and other supported mobile devices. Mobile phone investigation application with source code in Microsoft Visual C++, MFC, embedded C++ is useful for organizations working on AT+CPBR, AT+CBS, AT+CSQ, AT+CIMI and many mobile technologies. Smart phone inspection program is useful for developers to take detail knowledge about various functions related to mobile phones such as CeCreateFile, CeCreateProcess, CeReadFile, CeGetDeviceId, CeFindAllFiles, CeRegEnumKeyEx and CeRegOpenKey etc. Cell phone forensic application easily gathers all general information from your GSM and CDMA mobile phone. Mobile phone inspector software available with Microsoft Visual C++ source code and supports all windows operating system including windows 98, NT, ME, 2000, 2003, XP and Vista. Smart phone investigation tool supports all branded mobile phones such as Nokia, Motorola, Samsung, LG and Sony Ericsson etc. 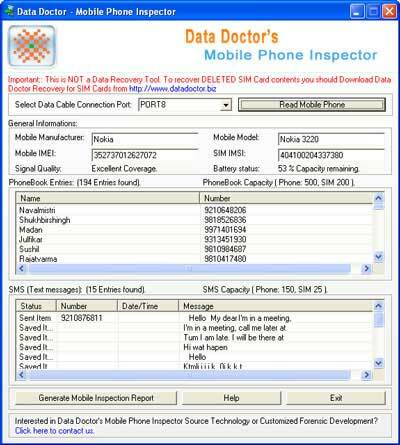 Mobile phone inspection program is free of cost but user needs to pay if software is required with its source code. Features: * Mobile phone investigation application supports Windows CE and Windows mobiles, WM5, WM6 based PDA cell phones. * Cell phone surveillance tool is an innovative mobile investigator that pulls out sim details, SMS capacity, memory status, battery usage, IMEI number with model number and phonebook entries. * Mobile phone inspection tool can easily access your mobile phone with the help of port connectivity for gathering general as well as important information. * Smart phone forensic utility is read only tool that provides complete SIM card information. * Freeware mobile phone inspector program allows users to fetch general details of all windows based mobile phones.